Mozilla has released the first version of its VR web browser, Firefox Reality. Version 1.0 is available now for Oculus and Google Daydream, and the company says version 1.1 is just around the corner. 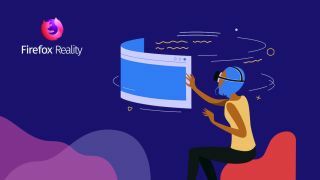 Mozilla announced it was developing a browser specifically for mixed reality (both virtual and augmented reality) headsets in April, enabling users to surf the web, interact with sites, and engage in virtual experiences. Much as the desktop and mobile Firefox browsers can be expanded by user-created extensions, Firefox Reality can be enhanced with third-party immersive experiences, including games and experiments, which can be accessed directly from the browser's home screen. "We had to rethink everything, including navigation, text-input, environments, search and more," said Andre Vrignaud, head of mixed reality platform strategy at Mozilla. "This required years of research, and countless conversations with users, content creators, and hardware partners. The result is a browser that is built for the medium it serves. It makes a big difference, and we think you will love all of the features and details that we’ve created specifically for a MR browser." While some tools, such as voice recognition, are already implemented, the browser is still in its infancy, and Mozilla plans to add bookmarks, 360-degree videos, support for Firefox accounts and much more in future releases.